It can be strange to imagine that your skin is one of the largest organs in your body, or that it’s even an organ at all. We see our skin every day, unlike our stomach or lungs, which are all neatly tucked away. But your skin is still an organ even it’s on the outside, and like any organ, it’s made up of various layers and tissues. Here’s a quick breakdown of the anatomy of your skin. Your skin is comprised of three main layers: the epidermis, the dermis, and the subcutaneous tissue. The epidermis is the outmost layer of the skin. This is the part that you see and interact with every day. The thickness of the epidermis depends on where it is on your body. For example, the epidermis on your eyelids is very thin (half of a millimeter) while the same layer on your heel is much thicker (1.5 millimeters.) This is because the epidermis serves to protect your body from outside dangers, like how the heel is thicker to absorb more impact than what your eyelid needs. Stratum Basale: This layer is the bottom layer, which has rectangular cells known as basal cells. These divide and push out old cells, which will flatten and move up to the surface of the skin. Stratum Spinosum: This is the thickest layer in the epidermis and works at both strengthening with keratinocyte proteins, and prevents infections with Langerhans cells. Stratum Granulosum: The predominant function of this layer is to move dead cells upwards to the surface. Stratum Lucidum: This kind of layer in the epidermis only exists on the hands and feet. It mostly reduces friction on the thicker portions of the skin. Stratum Corneum: The outside layer of the skin. This is the part of your skin you touch and see the most. It’s composed of dead and flattened cells. The dermis is the middle layer, which acts similarly to a storage center for the skin. This is where oil and sweat glands, nerve endings, hair follicles, blood capillaries, and connective tissues reside. It’s split into two parts – the papillary dermis and the reticular dermis. The papillary is the thinnest part of the dermis, while the reticular dermis is the thicker one. 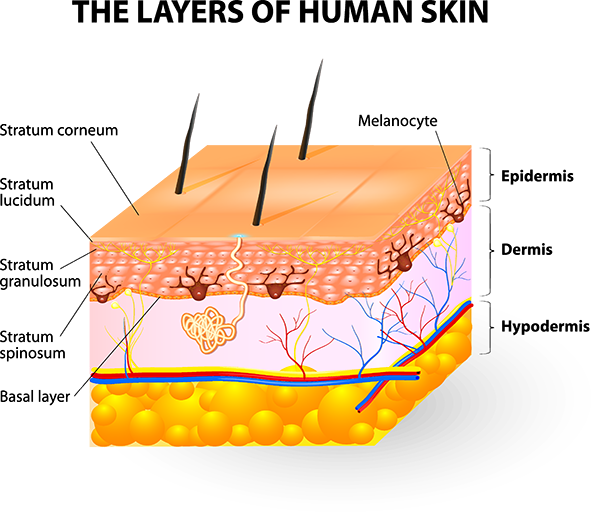 The dermis contains three different tissues types. These are collagen, elastic tissue, and reticular fibers. The sensations of touch and pressure originate in the dermis. They come from areas known as the Meissner corpuscle and the Lamellar corpuscle. The deepest layer of the skin, the subcutaneous tissue is mostly fat, connective tissue, nerves, and larger blood vessels. Like the other two layers, the thickness of this layer is dependent on its location within the body. Two of its most important roles as part of the skin is to regulate body temperature and be a cushion for falls or hits from foreign objects. Knowing how our skin works can be helpful in identifying when and where something has gone wrong, making it easier to tell your dermatologist about your particular issue. Like any other organ in our body, we must take care to keep it healthy. Just as smoking is bad for your lungs, there are similar hazards to your skin like long sun exposure. The better your take care of your skin now, the more it will repay you in the future.